I always struggle with anthology reviews and the ones I love, even more so. 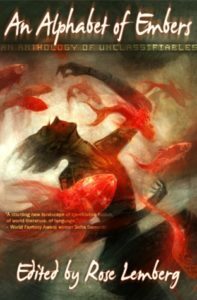 An Alphabet of Embers is a short story collection, even shorter than you would expect with some stories being only a few pages long, filled to the brim with speculative and magical worlds. It is an experience to read and demands you re-read it. An Alphabet of Embers is an anthology of unclassifiables – lyrical, surreal, magical, experimental pieces that straddle the border between poetry and prose. It lives in a place between darkness and sound, between roads and breaths, its pages taut with starlight; between its covers, words talk to each other, and have an occasional cup of tea. The entire collection is fantastic. Sure I have favorites: Jy Yang, Muneshwar, Khaalidah Muhammad Ali, Narayan, El-Mohtar, and Sereno, but the entire book is just brimming with magical words wound together with imaginary thread. What Lemberg has done is edited together a series of wonderfully diverse stories which push the boundaries of fantasies. They stretch against the walls of their cocoon, ready to burst free in bright colors. I loved that these pieces of fiction were shorter, because not only does it demand more from every word, but it allows you to easily re-read these over and over again. There are intense emotions of longing, gorgeous illustrations, and worlds you could have never imagined. I feel like I’ve been introduced into a whole new world of fantasy, full of mystery, growing trees, and swimming fish. There are spaceships, murder and shedding skin and the entire collection ends on a whirlwind of compelling fiction. An Alphabet of Embers is something for everyone because even though these stories are fantastical and defy your expectations, at the heart of them are captivating and haunting characters and stories which perplex and make you believe. This is the perfect escape from your commute, your sleepless evenings, and stepping into a whole new world of possibilities. You should pick up An Alphabet of Embers on Amazon(US) and add it to Goodreads. Disclaimer: I was sent a copy of this book in exchange for an honest review. Give me all the pushing boundary fiction recs!